Activities for elderly adults incorporated into each day help seniors thrive. Is your senior loved one participating in activities for elderly adults on a regular basis, or is she stuck in a rut that mainly consists of TV-watching, eating, and sleeping? At Hired Hands Homecare, we believe that enhancing senior home care services with enriching activities is a key component to ensuring the highest quality of life. Hired Hands is one of the leading Marin County senior care providers, in part because we believe our clients should be honored with activities that engage them and keep them involved in living life to the fullest on a daily basis. This means personalizing activities to engage our clients’ unique interests, hobbies, and ability levels. Our person-centered care begins with learning as much as possible about the senior’s preferences, dislikes, dreams, hobbies and life history. 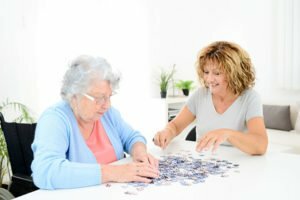 We get to know the senior through an interview that can include other family members if desired, and then develop a personalized plan of care to include a variety of appropriate enrichment activities. Successfully enhancing seniors’ daily experiences means not just customizing their activities to meet their individual preferences and tastes, but also ensuring that their daily routine has some variety. This means that on a particular day we may focus on activities that are designed to boost their creativity with a simple but meaningful art project. On another day, the focus may be on just having fun with a game of cards or taking a short walk around the neighborhood. Ultimately, our senior home care services will be crafted to help seniors achieve the highest possible quality of life. Hired Hands Homecare is a Marin County senior care company where enriching seniors’ daily lives and maximizing their independence are central components of our mission. Our home care services are designed not only to support seniors’ physical needs, but to enhance their everyday experiences as well. Contact us any time at (866) 940-4343 to learn more. See our full service area in California here. I like that you pointed out that good elderly care must have varieties of activity to make it effective for each person. I hope to find someone who does that so that my grandmother will not be bored with her daily life when we sen her to a facility. We just need to do this since all of us are already working, so there are times that she has no one around to take care of her.